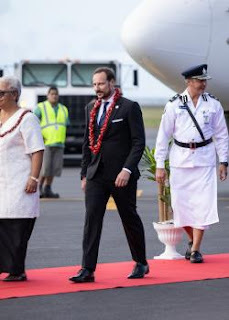 Samoa rolled out the red carpet to welcome Crown Prince Haakon Magnus of Norway on Wednesday, as he and his delegation arrived for his first official visit to Samoa. Three buses brought Police dressed in white uniform to stand at attention for the Crown Prince, and the official Samoa Police Service Band performed at the landing of the plane, and his exit from the plane. Prince Haakon will visit the Head of State and Prime Minister on Thursday, and tour the Vaisigano Bridge Project and Moata’a Mangroves sites. His visit is intended to strengthen the partnership between Norway and Samoa, which officially began in 1999. At the airport, Deputy Prime Minister Fiame Naomi Mata’afa and a diplomatic delegation waited to greet Prince Haakon, including Miss Samoa Sonia Piva who had the honour of adorning the prince with a red ula fala. “I had never greeted a prince before in my life, so that was pretty cool,” Ms. Piva said. She said it is an honour for Samoa to receive the Prince, who wants to make a difference in the Pacific. After exchanging brief words with the delegation, Police Commissioner Fuiavailili Egon Keil escorted Prince Haakon along the red carpet lined with armed Police, stopping occasionally to greet them. And then, with a nod from Deputy Prime Minister Fiame, the ceremony was over and a fleet of official vehicles quietly arrived to whisk the delegation to Taumeasina Island Resort, where a reception waited to greet them.